There were so many great DIY concepts made of the empty Ferrero Rocher 16 box, we really enjoyed looking through all the submissions! Ferrero Rocher has officially chosen their selections, congratulations to the Selected Artists Merel van Brakel, Matija Fudurić and Roos Koene. Please note that only with the start of the Ferrero Rocher campaign beginning next year 2019, all submissions will become visible to the public. Ferrero Rocher is one of the most loved sweets in the world. At the centre of the praline lies a perfectly roasted hazelnut, surrounded by a luscious, smooth filling and a delicate crisp wafer, all enveloped in creamy milk chocolate and finely chopped hazelnuts. Each exquisite chocolate is wrapped in luxurious, golden foil and comes in a transparent box. 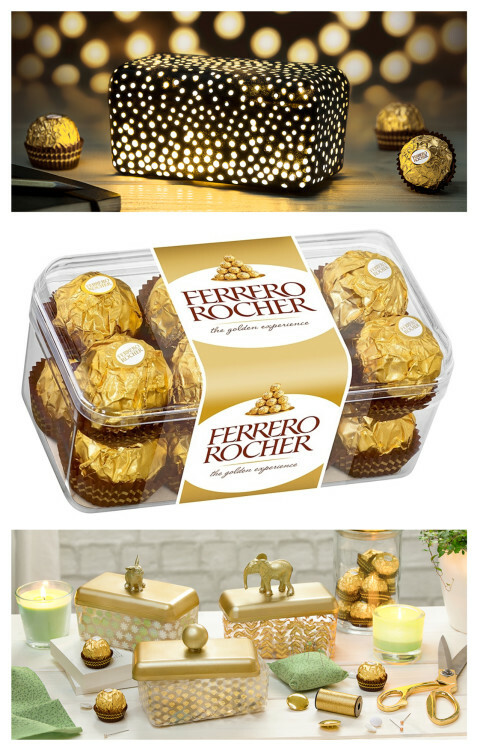 Ferrero Rocher makes a tasteful gift and a welcome addition to any gathering. Ferrero Rocher is inviting artists from around the world to create do-it-yourself ideas on how the empty transparent plastic box of Ferrero Rocher pralines can be reused in a clever and creative way. Create a step-by-step instruction for a do-it-yourself upcycling object made using the empty transparent box. The Ferrero Rocher Marketing Team is looking for enterprising ideas that are easy to recreate and useful. Artists are encouraged to use different materials in combination with the box. Artists may submit static visuals or animated visuals (of their step-by-step instruction). Before submitting your idea, please read the 'Things to consider' section below, and take a look at the mood board for inspiration. 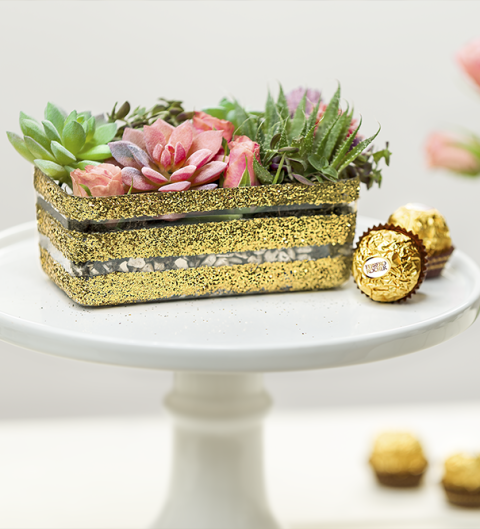 Ferrero Rocher will select up to three do-it-yourself upcycling objects that will be potentially showcased on Ferrero Rocher’s Golden Inspiration website. Additionally, the selected ideas will be rewarded with €2,000 each. Invent a creative do-it-yourself object that is useful and can be created using one (or several) empty transparent family boxes (for 16 pieces). Your idea can be for all areas of life e.g. at home, at work, for beauty or on the move. Ideas should be perfectly simple and comprehensible for everyone to build the do-it-yourself object. Choose a creative method that illustrates how the do-it-yourself object can be built. Either use static visuals (e.g. photography, drawing, illustration, etc.) or animated visuals (e.g. digital animation, stop motion, video or other film techniques) for your step-by-step instruction. Here you can find the high-res files of the transparent box. You may want to use different materials in combination with the transparent box (e.g. cardboard, paper, wood, paint, glitter, fabric, velvet, plush, sequins). Please make sure not to display or use any other brand-name products such as scissors, glue or any other products due to legal usage rights. Submissions should stay within Ferrero Rocher’s Golden Inspiration Color Palette of: white, gold, mint green, dark brown, black. No-Go’s are: red, orange, pink, purple, blue, silver or bronze. Artists are encouraged to use the provided high res images for their visualisation or buy a Ferrero Rocher Family Box (the costs will not be reimbursed). Please note that Ferrero Rocher is only looking for do-it-yourself objects that are made of the Family Box with 16 pieces. Take a look at this mood board for inspiration. Submissions should not include images of people or display other brands. Ferrero Rocher became an icon of affordable luxury within chocolate confectionery thanks to its strong visual identity: the inimitable golden wrapper, the distinctive paper cup and the transparent innovative box. Indeed this plastic box, which enables the content to be completely visible, surprised consumers and revolutionized the boxed chocolate market in the 80's. Since then slight changes have been made to the box over time, but always remaining faithful to its original style. 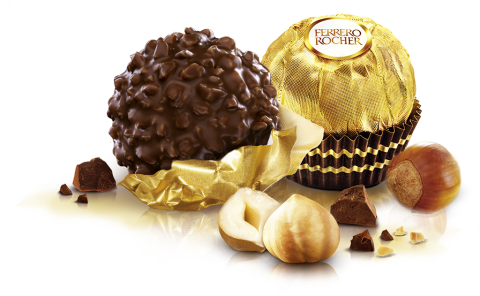 Ferrero Rocher offers a unique taste experience of contrasting layers: a whole crunchy hazelnut in the heart, a delicious creamy hazelnut filling, a crisp wafer shell covered with chocolate and gently roasted pieces. And thanks to its inimitable golden wrapper Ferrero Rocher is even more unique and special. Take the time to savor it and share more of life's golden pleasures together. Together with Ferrero Rocher. Potentially have their design showcased on Ferrero Rocher’s “Golden Inspiration” website. Receive potential exposure across Ferrero Rocher's social media channels e.g. in form of artist portraits. Receive €2,000 for each piece selected. Please note: Ferrero Rocher will not show submissions before campaign start in January 2019 (this applies to non selected work as well). This opportunity is open globally to those who are at least 18 years of age and the age of majority in their jurisdiction of primary residence at the time of entry. Artists are not eligible, where a participation is prohibited by law. Multiple submissions (up to 10) and artist teams are allowed. Please note that only with the start of the Ferrero Rocher campaign beginning next year 2019 all submissions will become visible to the public. Please do not upload your submission to your Talenthouse portfolio or share it on your social media channels till the official start of the Ferrero Rocher campaign. All entries must be original work (meaning not using third party pre-existing copyright materials). Do-it-yourself step-by-step instructions can be submitted as static visuals (e.g. photography, drawing, illustration, etc.) or animated visuals (e.g. digital animation, stop motion, video or other film techniques). Artists should retain their original files in the highest quality possible but static work must be submitted in JPEG or PNG, max size 10MB. Videos or GIF's should be uploaded as an .mp4 via the “Participate” tab to the Talenthouse player. You may use the material provided by Ferrero Rocher. All rights in and to the material provided is reserved by Ferrero Rocher. Please add a step-by-step instruction (in English) to the description field when you upload your idea. Please read the section "THINGS TO CONSIDER" carefully. Artists that are not selected will retain ownership of their work, however Ferrero Rocher has marketing rights to promote work on their channels and use it in an online voting for the duration of 4 months after campaign start in January 2019. All artists will be credited accordingly. The Selected Artists grant Ferrero Rocher all usage rights to their submitted work and will be required to sign a Release Form. In return, the Selected Artists will receive the specified incentives. The selected work can still be used for artist’s own portfolio purposes but only after campaign start in January 2019. The Selected Artists may be asked to modify their design to fit production requirements. Artists must join Talenthouse using an active email address in order to ensure they can be contacted should they be selected. Selected Artists must respond to Talenthouse within two (2) days of receiving the notification email or else will forfeit all incentives. Talenthouse reserves the right to remove inappropriate, offensive and harmful submissions as well as submissions that do not fit the brief and follow these guidelines or Official Rules. No purchase necessary to enter or be selected. The Ferrero Rocher Marketing Team will select from all qualified submissions. A qualified submission is one which meets all the Terms & Conditions, Guidelines and Official Rules.